Set off with Claire on an adventure through the uncharted continent of the casual strategy game Lost Artifact. For a long time, Claire worked as a historian and archeologist in a prominent university. When she chose her course in life she thought she'd be searching for ancient treasure, but instead ended up spending all her time reading. Then one day Claire noticed a peculiar coincidence. Had she really uncovered a treasure map of the ancient Tonauak people? So without a second thought, she left in search of the treasure. She had been waiting for so long and couldn’t miss her chance. What will you find there? 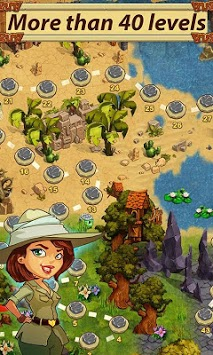 Get ready for island games, 49 vivid levels, lots of different objectives, increasing difficulty, a fun plot, and a unique world with captivating gameplay for any age. 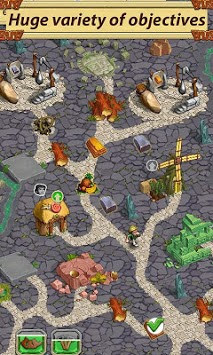 Build a city and manage resources, restore ancient statues, use powerful magic and draw power from holy places. With its simple controls and easy training, you’ll be playing like a pro in no time. - A unique world, similar to the Cook Islands, that gets its magic from ancient statues and holy places - real magic rush! - You can build a village. - A fun plot, vivid graphics, and unforgettable characters! 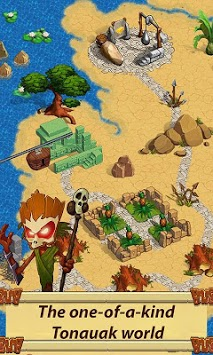 - Lots of different objectives you haven’t yet encountered!. - Dangerous enemies: wild men, ancient curses, bears, and crocodiles. - 4 unforgettable locations: forests, plains, tribal deserts and cursed lands.